This easy tutorial shows you how to install Kodi Gaia Addon in 5 minutes or less. The Gaia addon for Kodi is currently one of the best Kodi addons because it contains several excellent unique features which set it apart from other Kodi addons. If you like Kodi addons, then you’ll love the Best Kodi Builds, which give you tons of great Kodi addons all at once. Kodi Gaia addon is at the moment one of the best Kodi addons for streaming movies, shows, documentaries, and short films from torrents, usenet, file hosters, and streaming services. Gaia Kodi is currently optimized to make the most out of several debrid services. These debrid services currently include the Premiumize service, OffCloud debrid service, RealDebrid, and even EasyNews (a Usenet service). The Kodi Gaia addon has a professionally designed interface for quick navigation and content exploration. Gaia Kodi arrives pre-packaged with an amazing collection of media providers. Kodi Gaia addon also has support for several debrid services. Last but not least, Gaia Kodi has integrations for LightPack and Trakt, has built-in support tools, and much much more. Gaia Kodi Addon currently stands as one of the best kodi addons. Gaia is one of the best because its code is well-maintained and active. The Gaia Kodi addon is very slow on cheap (lower tier) Android TV Boxes / sticks. Install Gaia Kodi in 5 minutes or less using the step by step guide below. Why Should I Get Kodi Gaia Addon? Get Kodi Gaia addon now if you want to Stream Movies and Shows in Kodi. Gaia is a Kodi addon that lets you stream unlimited movies, TV shows, documentaries, and even short films. Kodi Gaia does this by sourcing torrents, usenet sources, file hosters, and several other streaming services. Gaia is strongly optimized for the popular debrid services such as OffCloud, Premiumize, EasyNews (news hoster), and RealDebrid. The Kodi Gaia addon has a very professionally designed user interface. This pro interface enables quick navigation in Kodi and efficient content exploration. Gaia comes pre-loaded with a mind-blowing collection of providers. This Kodi addon also has support for multiple debird services, Trakt and LightPack integration, several support tools, and much much more. Gaia supports various debrid services. Debrid services provide a unified way to stream movies and TV shows. Furthermore, connections to debrid servers connect as always encrypted and private. Gaia has multiple mirror repositories. We strongly advise that you install all available repositories in Kodi. In case one repository fails, updates and other fixes easily arrive from another (alternative) repository. Follow the given steps to install the latest version of Gaia on your Kodi device. Unknown Sources: Enable installation from unknown sources. From the Kodi home screen, go to Settings. Then select System, then Addons, then Unknown sources. Download Repository: Download the Gaia repository quickly from here. Install Repository: Now install the Gaia “repo” from the zip file. From the Kodi homescreen, select Addons, then choose Install from zip file. Now select the downloaded file. Install Addon: At this step, just install the Gaia addon from the repository you added in the previous step. From Kodi’s home screen, select Addons. Then choose Install from repository. Now select Gaia Repository, then choose Video addons. Finally, select “Gaia”. Launch Addon: Now just launch the Gaia addon. To launch Kodi Gaia, from the Kodi home screen go to Addons, then Video addons. 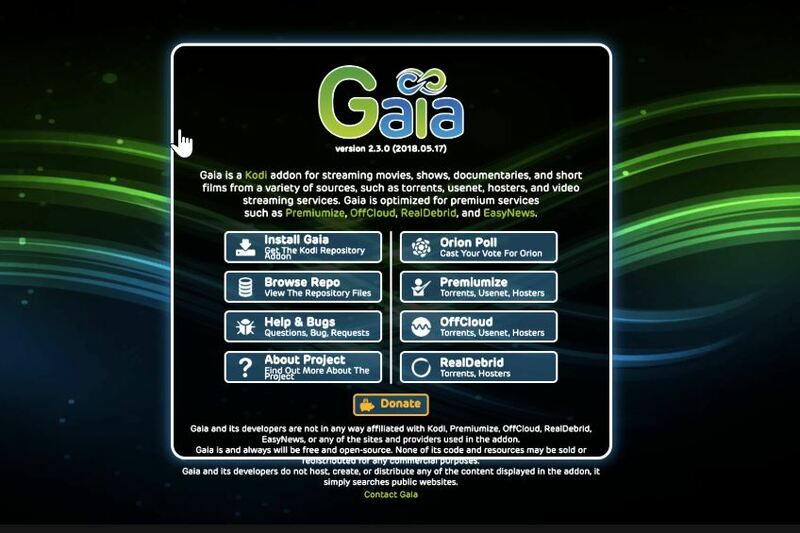 Now just select “Gaia” and start streaming! Fixed Elementum and Quasar buffering.